We are back home after a wonderful trip to Florida and Georgia. It was a shock to come back to such cold weather. However, the good news is that cold weather didn't stick around long. We are now enjoying an early spring. We didn't stay home long. Five days after arriving back in Webster City, we headed for Duluth, Minnesota. Our grandson is on a robotics team that competed at the First Robotics Competition regional championships. His team, Crimson Robotics, was the defending champion. This year they made it to the quarter finals where they were defeated. Jerry and I then headed out for supper before the awards ceremony. We missed the most exciting part. During the awards ceremony they learned that Alex, our grandson, was one of two nominated for the Dean's Award - quite a feather in his cap. But that wasn't all. The team won the Chairman's Award. It's the highest award you can win at the event. It automatically qualified them togo to nationals in St. Louis. Go Crimson Robotics. 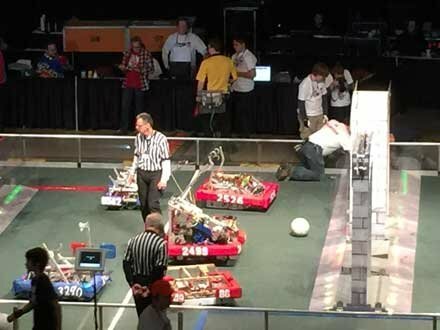 Robots are being inspected by referees prior to the match. We are red 2526 robot at the top. Jerry has never attended one of my workshops. This was no exception. However, due to distance it wasn't practical for him to return to the camper after dropping me off for the workshop. He and Daisy remained with me and were in and out as the day progressed. I couldn't believe Daisy. She quietly remained on her blanket all day with just four excursions to a wonderful, huge yard behind the Salvation Army where we were meeting. 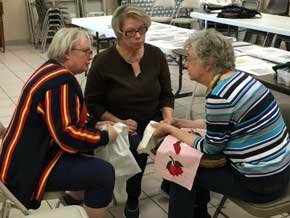 I have Jo Ann Jolley of the Martin County Quilters to thank for my new class. She requested a blended class - that is a class that combined both my beginner's class and my intermediate/advanced class. 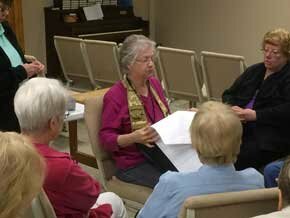 She explained that they didn't have enough beginners or intermediates to fill a class. Could I help them out? I decided to give it a go. It proved to be both exciting and practical. Using my normal format we would meet at the top of the hour for two demos - one for the beginners and one for the intermediates/advanced. Then the students were sent back to their table to practice one of the techniques that I had just taught. The demo for the beginners served as a refresher course for the intermediate/advanced students. The intermediate/advanced techniques I taught gave the beginners an idea of what they would one day be able to achieve. This format was so successful, I used it in all but one of my remaining classes in Florida. No one objected. Jo Ann sent me the e-mail to the right after the class. It pretty much says it all. I may offer 3 classes now but I have the feeling I will only be teaching one - the combined class. 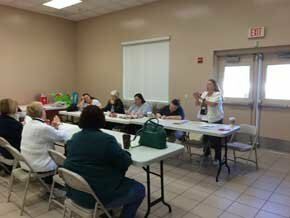 Thank you so much for the wonderful workshop you held for the Martin County Quilters! We all enjoyed the day and learned so much. 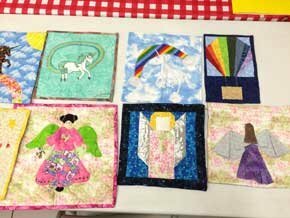 Your students ran the gamut from true beginners to experienced appliquers and everyone went home happy and inspired. 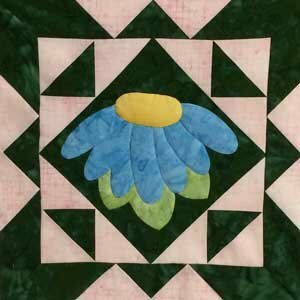 As a quilt instructor I know how difficult it is to teach a class that includes various skill levels and I am extremely impressed at how well you managed that. Though I’ve appliquéd for years, I’ve never tried back basting before and will add it to my techniques. Practicing the techniques you taught will help me move up to the next level in my appliqué skills. 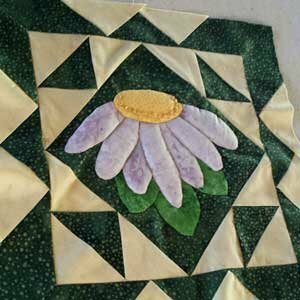 I’m working on completing my class sample and I plan to use them on your new block of the month series. 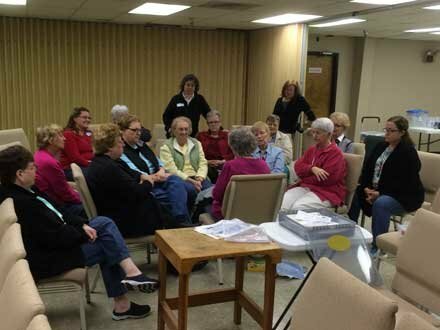 This quilt guild was insistent that we come to their guild for a workshop/trunk show. I explained that we could only stop on our way back from Florida and wouldn't be able to come to their regular monthly meeting. That was OK with them. They would arrange a special time and meeting place for us. I couldn't refuse. I'm so glad I didn't. This guild did something very few guilds are able to do. 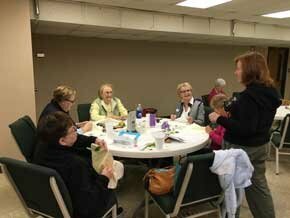 They filled a 20-student class with 20 intermediate/advanced quilters. 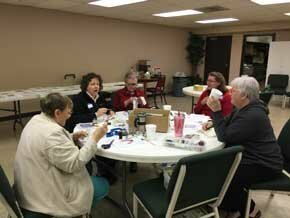 These gals were so eager to learn a new technique to add to their appliquer's tool chest. I had a delightful time with them. 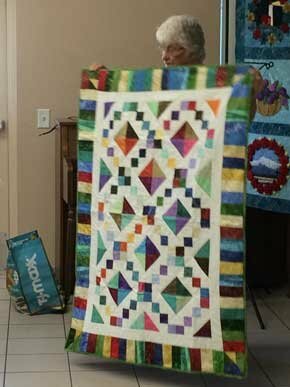 This month's block is called "Cosmos". I'm sculpting my flowers but you don't have to. These blocks will be beautiful with or without padding. I've made my "cosmos" blue. Have you made any of the blocks in our new free BOM yet? If you have I would love to have a photo to share with my readers. You don't have to crop it. I'll do that. Just send it to me at abqhaidle@mchi.com. I'm also going to make last month's pattern and the instructions for the quilt available as well. The instructions have been updated to reflect the correction that I told you about last month. 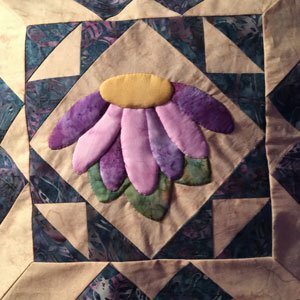 Georgie McKenzie chose to make her "Cosomos" in lavender. (left) Karen Johnson's "Cosomos" is to the right. She has done it in shades of purple (my favorite color). Block 3: Cosmos Hobbs Polydown 1 layer was too flat. 2 layers were better but were a little hard to work with. When it was done, 2 layers looked and felt good.